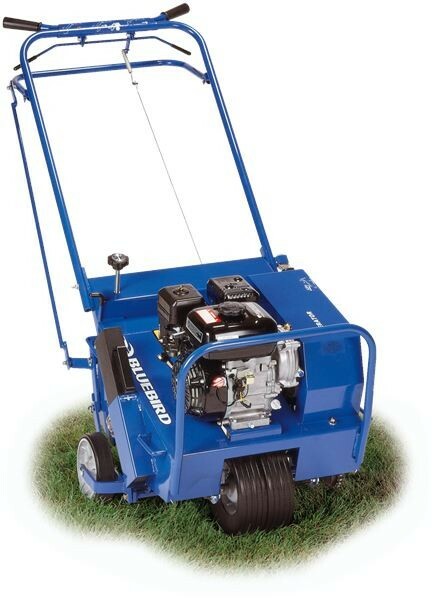 Bluebird 530 Lawn Aerator. Greater productivity, better maneuverability and a user-freindly design are just a few of the features that make the 530 a breeze to operate. Greater productivity, better maneuverability and a user-freindly design are just a few of the features that make the 530 a breeze to operate. BlueBird's patented, free-wheeling tine system allows even inexperienced users to easily aerate corners and tight areas. Operators of the 530 will appreciate its simple design. A folding handle, lift handles and semi-pneumatic front tire provide easy transport, while removable side weights offer optimal soil penetration and balance for easier slope aeration.